This week, for your reading pleasure, I am writing about roast suckling pig from Indonesia, home to the world’s largest Muslim population. Unexpected, perhaps? In case you didn’t know, Bali is home to the majority of Indonesia’s Hindu minority. In fact, more than 90% of Bali’s population adhere to Balinese Hinduism, a sect that is not found elsewhere. I wouldn’t do the religion justice if I were to write about it, so I’ll just stick with what I know and what I like: eating pork. Bali is a haven in Indonesia for pork eaters. 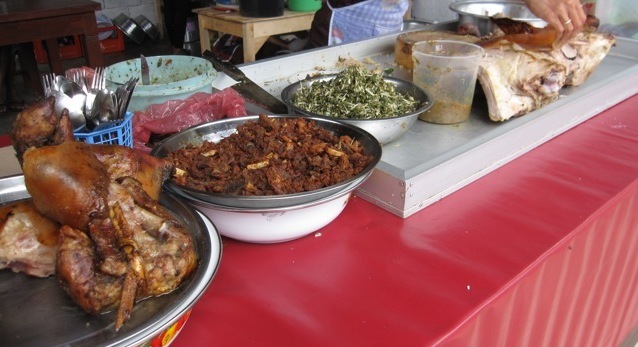 Many domestic non-Muslims travel here and make a point of eating as much pork as they can before returning home, where most restaurants are halal and don’t serve pork. The influence of Islam is so strong that in my hometown, Jakarta, even Din Tai Fung serves only chicken xiao long bao (soup dumplings). Ridiculous, no!? However thankfully, in Bali, there is a wide option of dishes for the pork-hungry, from barbeque baby back ribs to char siu. OK. No question about it. This is the best pig I’ve ever had. Absolutely, the best. I mean is there anything more beautiful? Do you think that even the finest French chef could ever come up with anything as delicious or as beautiful as this? I think not. It’s the mountain-top of pork. And I am there. I am not much of a cook, so in my amateur tongue I will describe it as baby pig stuffed with a blend of spices (most of which I do not know how to say in English) and spit-roasted. The spices are the magic. It is these unique flavors that make Bali’s roast stand out from other roast pig dishes elsewhere. Indonesia is, after all, the country of former Spice Islands. I say joint because it is not exactly a restaurant; it still has no name, no fancy store front, just several tables and a place for three ladies to prepare the dish and drinks. The building is not even wired for electricity yet. But the steady stream of people getting their babi guling to-go and/or for dining in is impressive for only its third week in operation. Every morning I assume the ladies spit-roast the pig at home and then come to this place to set up shop for lunch. I see them setting up on my way to work before 9, and when they run out of meat, they call it a day. This gives me confidence that their pork is always fresh. It’s basically the bare minimum of a pop-up restaurant, without the hype and indie cred of the West. The meat is so tender and flavorful that my co-workers and I find ourselves back here more than once a week for lunch. At only 12,000 IDR a plate (that’s roughly 1.50 USD), how could you say no? I’m sorry I don’t have any pictures of the dish itself, but each plate consists of rice, tender meat, crispy pork skin, blood sausage, and fried intestines. I am sure at least one of the above will gross out most people, so you could always just request to have certain items excluded from your plate. 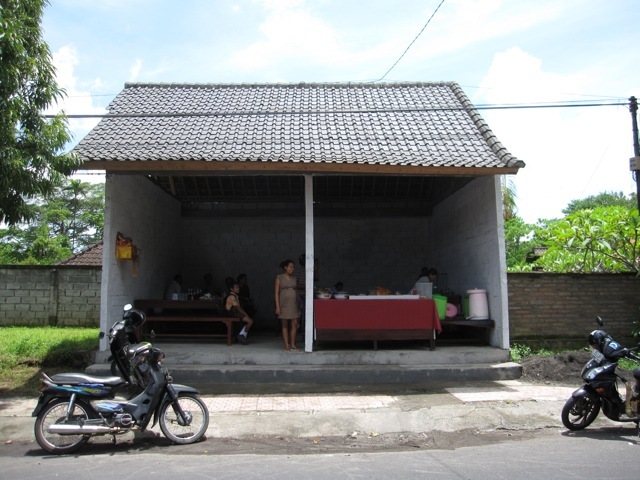 This anonymous babi guling joint is located on Jl. Raya Lungsiakan in Ubud, just slightly west of Fly Cafe and Sakanaya. They only open for lunch, so better that you come early before everyone else finishes the entire pig. Parking is difficult around this area so I advise renting a motorbike instead to come here—Ubud is best experienced on a scooter anyway! This entry was posted in Bali, Taste and tagged babi guling, babi guling ubud, cindy, roasted suckling pig, taste.